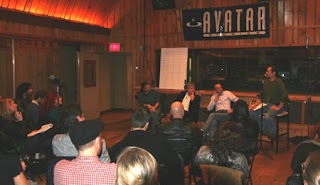 On October 20th, 2009, Avatar Studios hosted a pre-CMJ panel discussion called "Ask The Producers" with Steve Lillywhite, Kevin Killen and Roy Hendrickson. We held this event in the spirit of CMJ to open a dialog with independent artists and to share some of the knowledge we utilize daily as a professional recording studio in the hope that the information might be helpful to artists. People were asked to submit their questions for the panel in advance when they registered for the event. There were basically three broad categories of questions. The first type of questions had to do with production - e.g. trends, lo-fi, workflow, home vs. studio recording. The second had to do with how technology impacts production - e.g. the use of click tracks, Autotune, grids, ...etc. Finally, the third had to do with the role of a producer and how he or she interacts with the artists. I won't repeat the specific questions here, but you can watch the six-part video series of the panel discussion on Avatar’s YouTube channel. The panel discussion was followed by a one-on-one consultation session between the lucky participants and one of the panelists. It was not unlike "speed dating" where the artists were given 15-minutes to ask any questions or pitch any project they have worked on. It was a unique event and presented a rare opportunity for artists to interact and receive advice directly from experienced producers. It also gave us a glimpse into how resourceful and creative artists are in getting their projects done. When I asked Kevin Killen for hints on how artists should prepare for a consultation session like the one we had, he gave me the following pointers. I thought Kevin's hints were a good checklist for artists in evaluating their own production direction and would like to share them with you. 1. How should you maximize your budget? 2. How should you record with your budget? 3. Can good production or arrangement alter your song for the better? 4. How can you maximize the assets (i.e. gear, space, instruments, …etc.) you have? 6. What are the strengths and weaknesses of your act? 7. Do you have a sound or are you searching for a sound? 8. Where do you want your musical career to be in a year? What do you need to get there? 9. Are you truly motivated for success? Will you do whatever is necessary to achieve it? In the past, we as a studio did not get too involved with specific production issues other than how to set up, get gear that was needed and record the session well. We felt that production concerns should be addressed by the producer and/or the artist. Based on the questions we received for the panel discussion, we found that we could offer a lot of suggestions based on our experience so that artists are aware of what options they have. Production decisions will still have to be made by the producer / artist, but at least they can do so armed with more information. As stated in past entries, artists should view us as a resource center. We strongly encourage you to tap into our knowledgebase and have an interactive dialog with us. Avatar happens to be a vibrant community of professionals working in the industry. We have tenants in our building who are musicians, songwriters, producers, engineers (including mastering) and people involved with specific expertise from record distribution to music for advertising and films. We deal with session musicians, freelance engineers, arrangers, gear manufacturers, guitar & drum techs, rental companies and other professionals who provide support us on a daily basis. Part of the value we bring (included in the cost of our rooms) is the opportunity to pick our brains for your session. You should take full advantage of it. Check out our Indie Zone page where we will post info specifically of interest to indie bands.